Neymar, Gabriel Jesus and Philippe Coutinho could not find a goal in London on Tuesday night. Neymar alongside John Stones at Wembley Stadium. 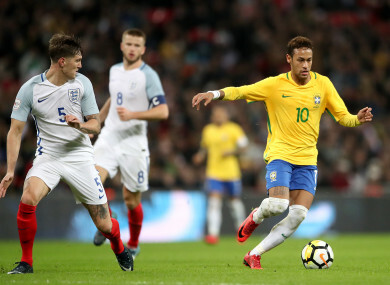 NEYMAR AND HIS Brazil colleagues were held to a frustrating goalless draw after a spirited display by a callow England team in Tuesday’s friendly match at Wembley Stadium. Brazil coach Tite was able to name a first-choice starting XI, but despite the presence of Neymar, Gabriel Jesus and Philippe Coutinho in the visitors’ line-up, they tested England goalkeeper Joe Hart only three times. For Gareth Southgate’s England, who were once again without stars such as Harry Kane, Dele Alli and Raheem Sterling through injury, it was a second successive encouraging 0-0 draw following Friday’s stalemate with Germany. Liverpool forward Dominic Solanke’s appearance as a late substitute made him the sixth England player to have made his debut over the two games. There was a samba band in the away fans’ section and the visitors’ forward forays drew shrill cheers from their yellow-shirted compatriots in the stands, but Brazil’s football was all style and little substance. Yet for all their back-heels and bravado, Brazil made few inroads, with Neymar twice ballooning shots high into the seating behind Hart’s goal. Brazil created their first clear chance early in the second period when Neymar’s pass freed Coutinho, only for Hart to block with his legs. Ashley Young marked his return after four years in the international wilderness by sliding in to block from Willian seconds after coming on, while Hart stood up well to thwart Roberto Firmino from Neymar’s pass. Solanke, 20, might have claimed a famous winner at the death when Young’s deep cross from the left found him unmarked at the back post, but Alisson slid out bravely to block. Email “Young England stifle Neymar's Brazil as Gareth Southgate records successive stalemates ”. Feedback on “Young England stifle Neymar's Brazil as Gareth Southgate records successive stalemates ”.